The market took a breather yesterday with many previously strong indexes and commodities selling off. The decline in silver was especially pronounced and produced a reverse hammer candlestick which has obviously bearish connotations. Of course, yesterday the CME raised the margin requirements for silver from $5000 to $6500. While this is being credited with causing the reversal, I don’t think that it completely explains what happened. It definitely contributed to it but often we grasp at news or reasons for the market’s moves when all you need to do is watch the price action itself. Anyone paying even cursory attention would know that the precious metal was already extremely overstretched to the upside and had been sporting extreme bullish sentiment for some time. I outlined just how extreme in late September when silver reached a new 30 year (nominal) high accompanied by a 95% bullish DSI. Silver managed to shrugged that off and went on a parabolic rise peeking above $29. Personally I was expecting it to reach the nice round number $30 before reversing. But it doesn’t look like it is going to now. Needless to say, the RSI indicator also reached an extreme overbought level yet again. Note that I’m ignoring instances where either one or the other is at an extreme and looking at just instances where they are both signaling an overbought condition. This confluence of overbought extremes identified the major tops in silver in the following years: 1982, 1987, 1998, 2004, 2006 and 2008. The current condition remains to be seen but historical precedent would suggest this is a major inflection point. Interestingly enough, the large commercial hedgers have slowly reduced their large net short exposure since late September. They are still maintaining a large chunk of contracts short (54,811 net short) as of November 2nd, 2010 which is the latest data available. Meanwhile, small speculators are net long with 16,257 contracts. Thanks for your work! Regular follower. What is a good instrument to ride this downtrend in Silver? ZSL ? or puts ? Be really careful with any leveraged ETFs as they will not be able to keep up with the underlying over the medium to long-term (as you can see in this example with the oil ETF). Too many huge silver shorts for too long and very little industrial use silver above ground. Silver will blow your shorts off. This type of thinking is exactly why people can’t make money trading. By your own admission you said silver was stretched in late september. Thats about $35000 a contract ago. So why is now any different. This top picking using some useless statistics is dangerous. Stay with the trend and just use stops to exit. Trying to short silver is stupid. C Franklin, semantics. Picking tops isn’t more dangerous as going long, given that both approaches are taken with due diligence and money management. Parabolic tops are by their very nature unsustainable. There are many industrial uses for silver and new ones discovered all the time. Do you even know what are you talking about? Silver is manly industrial metal these days. As a broker, the biggest losses I’ve witnessed in this business have come from investors trying to time tops and bottoms in the midst of a structural bull market. Virtually all, end up leaving money on the table at some point. If you think you’re smarter than the institutional traders and the bullion banks, then go for it. But remember, in a structural bull, you should rellish the corrections as buying opportunities. Trying to guess the next cycle top to sell ahead of a brief downturn is how money gets taken from from weak hands. I believe the very best money is made at the market turns. Everyone says you get killed trying to pick tops and bottoms and you make all your money by playing the trend in the middle. Well for twelve years I have been missing the meat in the middle but I have made a lot of money at tops and bottoms. I’m always thinking about losing money as opposed to making money. Don’t focus on making money, focus on protecting what you have. If you’d just bother reacting to price and price only, you won’t have to worry about the losing proposition of trying to”figuring out” where it’s going or for calling either tops or bottoms. Buy weakness and sell (into) strength and throw that crystal ball in the garbage can where it belongs. I personally don’t care whether silver goes up or if silver goes down. I only react to the price. And everything else is just….noise. If it’s down some, I’ll buy some. And if goes up some, I’ll sell some. Of course I have core positions that were bought at MUCH lower prices and are untradable. But this trying to call tops and bottoms is a LOSER’S GAME and I personally will have NO part in it and recommend you do the same. Winners in any market CAN’T pick tops and bottoms and those that say they can are LIARS & FRAUDS. Buy weakness and sell (into) strength is an old cliche but besides being the TRUTH….IT WORKS CONSISTANTLY!! PEJ, Gopal, Too dangerous to short SLV. A gap up in this environment could wipe you out. Buy puts or ZSL. People who have never worked in an IB mistakenly believe that the IBs are short all the precious metals. This even leads to conspiracy theories and claims of “price suppression”. Those short positions are actually either commercial hedges by producers or hedges for other products which they have sold (options, exotics, notes, swaps, indices, etc.). GATA and so forth are the conspiracy theories I’m talking about. Anyone who knows how IB works knows that traders in banks, like traders everywhere else are just committing the same mistakes and are prone to the same behaviour. Just as a matter of exercise, supposing you are right, please tell me how much JPM and HSBC would be loosing on these short position in the last few months. And also, please tell me why they would be holding these positions that are moving against them, for so long? Sometimes it is better to say nothing and be thought a fool than to speak up and remove all doubt. JPM and HSBC together hold short positions on the COMEX that exceed 1/2 of the global annual supply of silver. There is no reality on this earth in which this constitutes a hedge against long metal holdings. To make matters worse, the short position of JPM alone exceeds “all” COMEX silver deposits by more than 3X. This constitutes a “naked” short position which is in violation of COMEX rules and commodities trading law. Say what you want about GATA and the rest, but they will eventually be proven right. The two bullion banks mentioned above are under investigation by The Dept. of Justice, and the investigative arm of the CFTC and are now being sued in a class action in three separate cases for illegal trading practices, price manipulation, collusion and violation of RICO provisions. There will be more on the heels of these. If you want to hear a lame explanation for why they continue to hold these short positions against the obvious mounting losses, maybe you should try for a front row seat at trial. the only way j p morgan can get out of this mess is default or buy back their naked shorts. if silver continues to climb katy bar the door. we are going for one hell of a ride! I think we are on a hell of a ride! JPM & HSBC is in for a substansial loss having so large a position of silver shorts NAKED. The reason they are still all in is that they hope that the “weak hands” throws some “cheap” silver to them. I started investing in silver stocks 3 years ago, so I can live with a small correction downwards. In the long run the banksters will have to throw the cards! You have successfully removed all doubt that you are a silly hapless fool as Puroman so perfectly pointed out, with absolutely no clue, none at all, not even a little bit. Next time you have a thought backed by your COPIOUS experience as an Introducing Broker and your clearly superior knowledge of the markets and how things really work…. just be quiet huh? You are 110% correct and I don’t even need to provide any further evidence, it is that obvious to anyone with 1/4 a brain and the slightest attention span. Nice work, keep these morons in check. And please, to everyone here, I kindly request that we maintain a civil tone of discourse. It is fine to have disagreements and a clash of ideas but there is no need to get personal. I would tend to agree with Babak, being rude and pedantic doesn’t help to make an argument. IB means Investment Banking. I wouldn’t be surprised, even if the IBs were short 50% of the global production. I’m thinking Puroman is confusing “supply” with “mine production”. Many players in the mining business have hedged their production, and that’s what investment banks do, so they are naturally short the silver contracts. Then again, all these conspiracies are non-sense as soon as you’ve actually worked in a Hedge Fund or a bank or any dealing desk. You’ll see that speculative positions are very much positve for both little and big speculators, and that there are obviously net short commercial positions, as expected. In my wirehouse world, the “fool” quote is nothing more than a friendly jibe and we use it all the time. I didn’t intend it to sound mean-spirited or to ignite follow-on commentary by others. My apologies. Regarding a specific citation for the shorts v.s. world production numbers it is pieced together from a host of different sources. As you know, the open interest numbers change on a daily basis and, sometimes, quite dramatically. I do the math myself periodically from the committment of traders report to keep tabs on what is happening. But for your readers, here are a couple of citations to make it easier: Nov. 1, 2009 Gold Speculator - “JP Morgan is short 200 million ounces of silver”. From Ed Steer’s Gold and Silver Daily Oct. 17, 2010 - the total COMEX short position is 76,168 contracts [times 5,000 oz. per contract] this represents 380.84 MM oz silver short. The current lawsuits against JPM and HSBC charge them with holding 85% of all silver short positions. Using the numbers from just the citations above, this represents approx. 323,714,000 ounces silver held short by JPM and HSBC. Published figures for 2009 world silver production are 709 million ounces. So, in this example, the JPM/HSBC short position represents 45.65% of global annual production. The numbers are obviously an ever moving target and the bullion banks have been steadily “reducing” their net short exposure over the past several months. While I do not save my calculations, I can tell you that the percentages held short by the two bullion banks have been higher. Whether at any point in time, they hold short one-half the world’s annual supply, or 45% or 55% is splitting hairs. At these position sizes, the conclusions are inescapable. The blogosphere is what it is and everyone is entitled to their opinion. But if bloggers wish to castigate GATA, and silver experts like Ted Butler with over 20 years silver market research experience, then they really should have better command of the facts. You are correct. When I said world’s annual supply I did specifically mean annual mine “production”. However, in reality, the two numbers are not that dissimilar. 2009 mine production worldwide was 709 million troy ounces. Available world “above ground” supply today is estimated at approximately 1 billion ounces. Industrial use consumes nearly 90% of annual mine production each year leaving less and less available for investment demand. There is very little futures hedging done by miners in the silver market. The reason is obvious if you understand the silver business. There are very few pure silver miners in the world. Most are base metals miners with silver representing by-product or sidestream metal. That is why royalty companies and silver streaming companies like SLW have such a great business. They enable the miners to monetize what is essentially a waste stream. There is little reason for hedging the future price. Moreover, nearly all of the short trading conducted by JPM and HSBC occurs in their proprietary accounts. Contrary to your assertion, they are not running a hedge business in silver for mining companies. They are running a speculation business in their own book and have, until recently exposed, been able to manage the silver price for their own profit purely because of their outsized positions. There is no law against making a profit. But there are laws governing how you go about it. I don’t know or care anything about conspiracy theories. I do care about fair markets and the rule of law. These two banks are being sued for market manipulation and racketeering. We all know full well that such charges are not brought lightly, and not without thousands of hours of preliminary legal discovery. The Justice Department has an open investigation as does the CFTC. Everyone is entitled to the presumption of innocence, but the evidence already in the public record is incriminatory beyond belief. I used to believe in Santa Claus and the tooth fairy too, but against the cold hard facts, I had to admit that their case just didn’t hold up. Puroman I really couldn’t have put it any more concisely myself, the facts that carry such gravity and grave significance to all will continue to fall upon def ears until it is too late. Such is the nature of humanity writhing in denial. I commend you. It saddens me too know that you (and others on your level) have such a difficult time accepting facts as facts, or hell being so adept as you say you are, not being able to due the diligence and see the plain writing on the wall for yourself. As opposed to taking an contentious position using weak claims and slanderous mockery against the better informed competitors, while asking the diligence of others to prove you oh so woefully wrong. Even after your begging pays off and the facts and numbers are spelled out before your bewildered eyes by one of these with superior knowledge you cannot admit defeat yet respond with fear and anger of what you simply cannot understand which has led to you ultimately straight back to the tactic of slanderous mockery Truth, while slipping ever more firmly into the entrenchment of denial. In conclusion I will say this: If you have so much trouble accepting the FACT that this and other entities of the same nature ARE massively manipulating Silver to the downside, then more than likely you haven’t given even a fleeting instance of genuine thought as to WHY they would monsterously suppress Silver prices! Oh man you are in for something let me tell ya, when you see the light it will be as if you were a newborn baby fresh out of the womb. P.S. I sincerely hope that you take some serious steps towards accepting the snippets of truth you are fortunate enough to recieve as just that… Factual Truth. Mainly for the good of us all but also because I don’t want your mind to be so far behind in the psychological shift taking place now, that when you are blessed with the shiny pearls of whats really at the root of all of this your head simply gives way and explodes due to sheer lack of ability to comprehend happenings of such astounding magnitude. Good luck. and only works when it is OPEN” makes it so imperative to evaluate BOTH sides fairly. Our society is simply awash with DISINFORMATION promulgated to achieve some personal or corporate objective, usually underlain by some kind of profit motive, often at the EXPENSE of the targeted group of the intentional disinformation. The diametrically opposed positions demonstrated above are based in a common piece of such disinformation, and I believe is the foundation of the disagreement we are witnessing. A commonly believed piece of propaganda put out by the fractional reserve banking cartel is that banks only loan out a “fraction” of their depositors money, say 90%, and retain the other 10% as RESERVES! This commonly believed assertion is so nonsensical on its surface that it is hard to believe that the masses are fooled by it. ABSURDITY #1: Based on that falsehood it is further asserted that banks make their money on the “spread” between the paltry interest they pay on deposits and the higher interest they charge on loans, what nonsense! Doe’s any intelligent person really believe the banks margins are only marginally better than grocery stores or other low margin businesses? ABSURDITY #2″ How can you loan out a liability? Who do “deposits” really belong to, the Bank or the depositor? Nice piece of “slight of hand” is it not? If you are a depositor you want to know that the bank has money in reserve to pay you back if for any reason you want to make a withdrawal, obviously it is still YOUR MONEY, not the banks. ABSURDITY #3: What is this disinformation hiding? Simply this, the Federal Reserve Act of 1913, (or the Bank Act in other countries with established Central Banks) magically turns a LIABILITY into an asset. I.E. Banks are ALLOWED to create out of thin air as much as 20X NEW CURRENCY as what they have in reserves, (bank assets including DEPOSITS) so they in effect, by CREATING this DEBT MONEY are collecting interest on 20 or more times that which they pay a small fraction on. How else could they write off millions or even bllions in non performing loans? No less an authority than a former Central Bank Governor testified to the truth of my assertion. Graham Towers, former Governor of the Bank of Canada in 1939 testified before a Commons Committee that; “every bank loan is a new creation of money, and when it is paid back, it ceases to exist” and that has some devastating implications and consequences that are not understood by even the elite and best educated in the banking and government establishment. So what has this got to do with the debate between PEJ and Puroman you might be thinking, and the answer is quite profound. It speaks to the MOTIVE of price manipulation in the gold and silver markets, it is not just a question of immediate profitability on the SHORTING side that is way out of balance with reality as Puroman has so ably pointed out. The FACT is, there is an economic WAR GOING ON! The bankers are WORRIED because their fractional reserve Ponzi scheme is unravelling and they are DESPERATE to preserve the masses CONFIDENCE in their fiat created (counterfeit) currency. The price of Gold and Silver rising, (REAL MONEY) is exposing their scheme for the FRAUD that it is and undermining peoples faith in their legalized counterfeiting that since the 1971 detachment from gold, is shown to be an ABJECT FAILURE, which the politicians are unwilling to acknowledge because it would undermine their gravy train and chances at being re-elected. The battle is to try and salvage what has for them been a very lucrative system, enslaving the worlds working and productive class to DEBT that robs them of an ever rising percentage of their earnings through interest, not only on personal debt through credit cards, mortgages on homes, (why the word in French means a “death gamble) but also through the interest corporations pay on their DEBT FINANCING which they pass on to the consumer in the price of the goods they produce. But that isn’t the worst of it, the ever rising TAXES at all levels are for the most part, (probably around 50%) disguised interest as well, which is why the bankers love being in bed with the politicians. Government taxing power is the best collateral they can get! This is why governments become the “borrowers of last resort” currently being disguised as “quantitative easing” just another fancy term for further debt creation. The lesson the masses have apparently yet to learn is that NO GOVERNMENT can give anybody anything they do not first take away from someone else! The sad part of all this is that the DEBT PYRAMID (accumulated interest) has grown so large that it simply can not be paid, not in our lifetime, or even our children or grand children’s lifetimes. This means only one thing, repudiation through inflation and eventually HYPERinflation or restoring constitutional money based on TANGIBLE intrinsic value commodities, of which over 5000 years of recorded history, gold and silver have proven to be the best at preserving purchasing power. The ULTIMATE level of deception by the banking cartel that has enslaved us to debt is the assertion that gold is a “barbarous relic” that has no place in a modern economy. The cry of the entrenched “establishment” against gold is that it “pays no dividend or interest” and costs money to store. The real truth, a genuine comparison can only be made on the basis of PURCHASING POWER and on that metric fiat currencies come out a BIG LOSER, just look at the record. The U.S. dollar has lost almost ONE-THIRD of its purchasing power since 2000, gold in contrast is UP over 300% in the same time frame so you would be approx. 6 times better of this decade having your net worth in gold and/or silver than in interest bearing fixed investments. Now comes the ultimate truth, interest is mathematically impossible on the long term. How can I say that you ask, SIMPLE, just go back to Graham Towers honest testimony as a Central Banker! Since “every bank loan is a new creation of money, and when it is paid back it ceases to exist” we can deduce some simple but profound facts: 1) Only the principle of a new loan is ever created! 2) Over the life of a standard 25 year mortgage at an average 5-6% interest, approx. TWICE as much currency as was originally created is CANCELLED OUT, so in effect the bankers through interest have withdrawn from the market DOUBLE what they originally created. 3) There are only TWO possible conclusions from these indisputable facts; A) To keep an economy EXPANDING and also cover the interest the bankers are extracting, there must be an ever growing quantity and size of debt creating LOANS to keep the fiat system solvent. B) Those facts precisely fit the dictionary definition of a Ponzi scheme, and my contention is that the bankers who conceived and control this evil system AND the politicians who aid and abet them in this nefarious scheme should get the same treatment as Bernie Madoff. They have “made off” with the wealth of the nation and its citizens. They should likewise be stripped of their ill-gotten wealth to reimburse taxpayers as happened with Madoff and his deceived investors. If not jailed for life as Madoff is, they should at best be forced to live out their lives at an average working mans salary, or devote a good portion of their lives to community service. I am sure we could find intelligent, honest, fair minded people other than privileged millionaires or billionaires that could run the country more efficiently than the present cabal pulling the levers of power. Outstanding commentary! Lets all continue to purchase physical metals. Thats great- somewhere safe ,not in a safty deposite box. What # do you think silver will correct to? it would depend on the market environment. If the inflation trade remains the main driver, I’d say somewhere between 18 and 20… BUT… if the deflation trade resumes, i wouldn’t be surprised to see it back around $10. that would be a nice buying opportunity. I loaded on coins and bars at below $10 in late 2008. Great place to load up… in 2008. Well, the fed has only one choice and that is to print so i think the inflation trade will remain in tact for a couple of more years. I was thinking a correction to 22 per oz. So at 18….. i might have to borrow my neighbors truck. I am a hifi nut that occasionally buy silverwire for cables! Tried to order some more wire last tuesday, it was sold out. My usual supplier do not know when he can deliver again, it looks like the manufacturers are holding back delivery or has trouble obtaining raw materials. Some of our jewel and silversmith stores have a sign in their windows stating that they are buyers of old silver and gold. I asked for a reason, they claim that they are having trouble getting new silver. As I see it, there is plenty paper silver! But very little bullion. The price suppression scheme has caused a slump in supply, as mining for silver has been a lousy business for the last 30 years. It takes a long time to ramp up production. So my best advice is to stay long in silver! Your personal experience (plenty of paper silver but little actual bullion available) confirms precisely the commentary posted by James Turk over at King World News. It is his opinion that this situation is now very dangerous for the bullion banks. Simply because the low spot price in the COMEX market has raised the demand for physical and is exacerbating the shortage. If the longs elect to stand for delivery rather than settle in cash, there is enormous pressure on the naked shorts. Where do they hope to find the metal in a tightening physical market? The wonderful irony in all this is that if the banks need to score silver in order to settle, they now have to push prices higher - not lower. Because at these artificially low paper prices the physical market is hitting the bid! There is nothing for sale. I don’t know but I do believe if I were JP Morgan and HSBC I would be feeling kind of sick at my stomach right about now. My math may not be all that good but looks to me like if silver jumps one cent per ounce then JPM and HSBC just lost $3,237,140. So looking at the live market on silver it has climbed 57 cents tonight. Would that not be about $184,516,000.Sure hope they have some deep pockets. Now I can see why they say that if silver hits $50.00 JPM and HSBC are a done deal. When you hold 85% of all silver short positions you are definitely up to no good. JPM and HSBC -even if the fed allow them to go under with no bail-out, could they not continue to short silver using a foreign bank, not regulated by the U.S.? The big question is: can they avoid delivering physical silver bullion? Naked short selling is very dangerous, and “the cat is out the sack”. Will uncle sam save them locking in the silver price? It is going to be fun to watch a couple of TBTF banks in jeopardy! JPM got in over their heads on this because the government “arranged” their takeover of the Bear Stearns assets including their outstanding silver short positions. Bear Stearns was quite literally at the brink of going bust on this silver trade even then. COMEX membership has its members backing one and all. If these two big banks default, all the COMEX members are essentially on the hook. 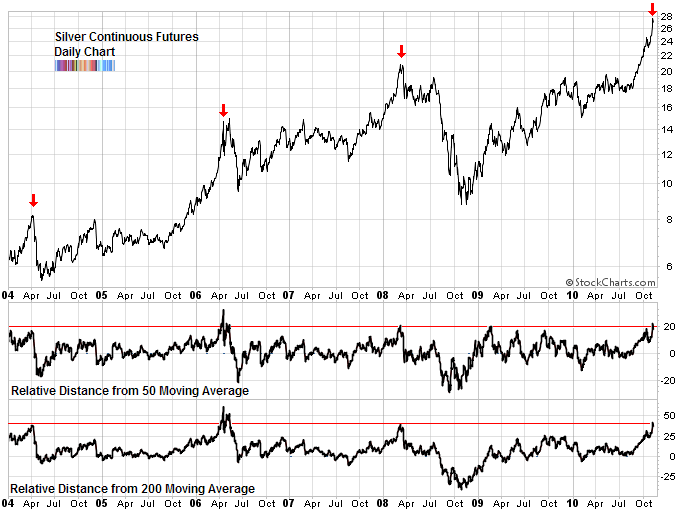 It would likely end the COMEX as we know it. So, if JPM would go bust from this and the US does not step in with taxpayer money to make them whole… then only a bank run by idiots would want to jump back into the same quicksand all over again with no federal support. No company is big enough by itself to trade against a global structural bull market and win. If this does go all the way to the end game with a failure to meet delivery, my best guess is that COMEX will provide the out by permitting all contracts to be settled in cash. It would then be up to the banks to either pony up or go hat-in-hand to the Feds for help. Either way, silver goes to the moon on a failure to deliver. JP Morgan is being sued for price manipulation of Silver. The fate of SLV with JPM as custodian is a subject of great debate. However, I’m not sure anyone has the inside track on what will happen. Those in the “very worried” camp fear that SLV is owed silver bullion to back the paper shares that have been sold to investors. If this is true, AND if there would be insufficient silver available for even JPM cover their short positions, then one could speculate that SLV was truly sold short and a run on the fund could result in some investors being unable to get their money out. If there really was not enough silver to cover the ETF shares that had been sold, then someone could end up left holding the bag. I have absolutely no way of knowing how likely or unlikely this is although Ted Butler has often said he believes that this fund has effectively sold shares naked short and they are awaiting delivery of bullion that may never come. Personally, I would trade options on silver futures before I would risk options on the ETF itself. Simply because in the unlikely event of a default, silver would explode higher, but the ETF could very well collapse. If you are a small investor/trader then options on SLV may be your only choice, but keep your eyes and ears on the JPM story and be ready to close out your call positions on “short notice” (pun intended). Sounds like its back to physical, until there is more direction on the JPmorgue thanks for the insight.